The Greek word “apnea” literally means “without breath.” Sleep apnea is a serious sleep disorder that occurs when a person’s breathing stops for 10 seconds or longer during sleep. It can be mild, moderate or severe, depending on how many times in an hour a person’s breathing stops (apnea) or becomes very slow (hypopnea). Apnea episodes may occur from 5 to 50 times an hour. According to the National Institutes of Health (NIH) sleep apnea affects more than 12 million Americans. However, due to a lack of public awareness as well as a lack of awareness on the part of healthcare providers, it is thought that the majority of cases remain undiagnosed despite the seriousness of the disorder and its consequences. There are three types of sleep apnea: obstructive sleep apnea (OSA), central sleep apnea, (CSA) and mixed sleep apnea, (MSA). OSA is the most common type of sleep apnea and is caused by a blockage of the airway, usually when the soft tissue in the rear of the throad collapses and closes during sleep. In CSA, the airway is not blocked but the brain fails to signal the muscles to breathe due to instability in the respiratory control center. Mixed apnea is a combination of the two. With each type of apnea, the brain briefly arouses people, triggering them to start breathing again, causing fragmented, poor quality sleep. As a result, sleep apnea may also cause poor performance in everyday activities, such as work and school, motor vehicle accidensa and academic underachievement in children and adolescents. If left untreated, sleep apnea can result in a growing number of health problems including hypertension, stroke and heart failure, irregular heartbeats and heart attacks. Additionally, memory problems, weight gain, headaches, even impotency can occur as a result of sleep apnea when left untreated. If you suspect that you have sleep apnea, check your insurance policy before making an appointment, as you may be required to get a referral to a sleep specialist from your primary care physician. You may also be required to go to a certain testing facility. Some insurance policies exclude coverage for the diagnosis and/or treatment of sleep disorders and some do not cover the durable medical equipment, and diagnosis and treatment can be a significant expense, usually over $1,000. Doctors who know sleep medicine may be pulmonologists (specializing in lungs), neurologists (the brain), otolaryngologists (the ears, nose and throat), psychiatry (mental health) or primary care physicians. Some doctors may be certified through the American Board of Sleep medicine (ABSM)., or hold degrees that meet the requirements of this board. At any rate, you will likely be referred to a sleep center. If your doctor does not refer you to a specific sleep center, you can visit www.aasmnet.org for the most up to date list of accredited member sleep centers and laboratories. At the sleep center, you can expect to undergo a sleep study, which uses several devices to record activity during sleep. These generally include an electroencelphalogram (EEG) to measure brain waves and an electroculogram (EOG) to measure eye and chin movement, both to monitor the different stages of sleep. An electrocardiogram (EKG) will measure heart rate and rhythm; chest bands to measure breathing movements and additional monitors to sense oxygen and carbon dioxide levels in the blood as well as monitors to record leg movement. None of the devices is painful and there are no needles involved. Generally, your doctor will prescribe lifestyle changes and CPAP(Continuous Positive Airway Pressure) therapy, but surgery is an option if these treatments fail to succeed. The American Sleep Apnea Association identifies CPAP therapy as the most common treatment for the condition. CPAP therapy works by preventing the airway from closing during sleep. It is administered at bedtime through a nasal or facial mask held in place by Velcro straps around the patient’s head. The mask is connected by a tube to a small air compressor. The CPAP machine sends air under pressure through the tube and into the mask, where it imparts positive pressure to the upper airways, preventing the tissues in the back of the throat from collapsing during sleep. CPAP therapy can be an extremely effective form of treatment, however the biggest problem is non-compliance. It has been estimated that over 65% of patients use the machine for a maximum of just 4 hours per night when it should be used for the duration of the patient’s sleep. In many cases, patients report using the CPAP for just a few nights out of the week. Discomfort is a major factor contributing to non-compliance. During side sleeping or stomach sleeping, the mask presses and rubs against the patient’s face, which is a major comfort problem and can also distort the mask, causing leaks and furthering the non-compliance problem. Contour Products has developed a solution to the issue of CPAP comfort and compliance, called the CPAP Multi-Mask Sleep Aid. The CPAP Sleep Aid works with all major brands of styles and masks. 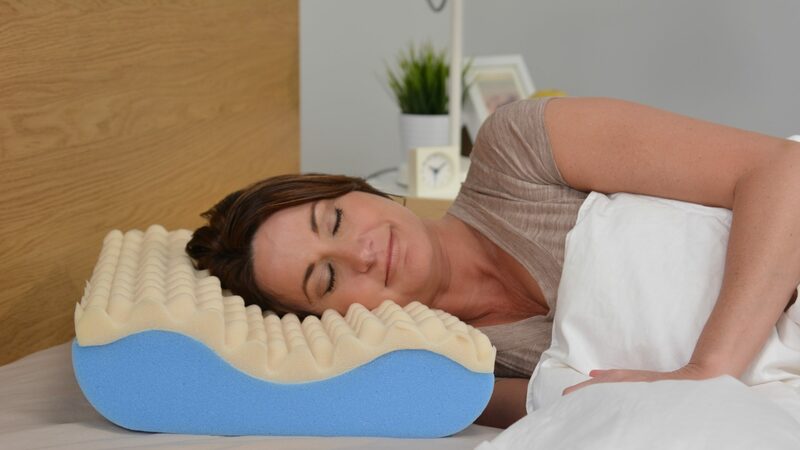 For more information on the new sleep aid pillow for CPAP and Sleep Apnea patients, Visit Contour CPAP Pillow page.